Nothing could be finer than to be in Carolina in the Morning . . .
A song that I learned when I was little. and all of us kids on our Sunday drives. 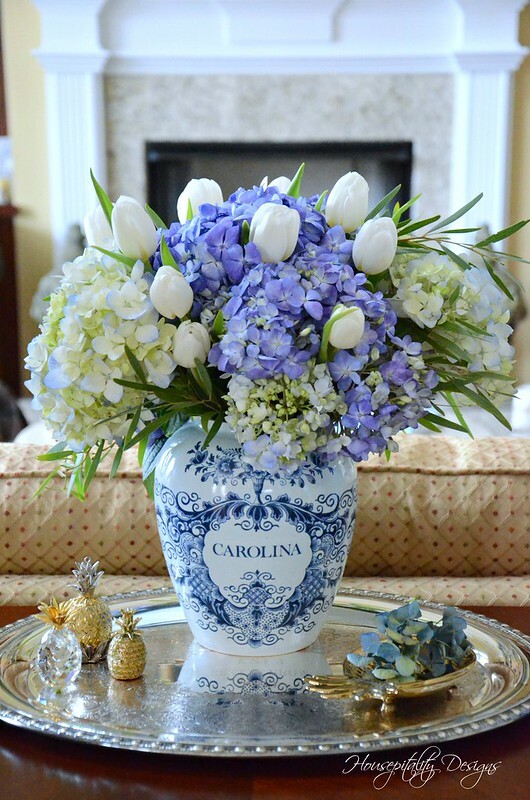 Today, what could be finer than flowers in a Carolina Delft Tobacco Jar for Floral Friday! While at my favorite consignment shop, Always Home in Durham, N.C. 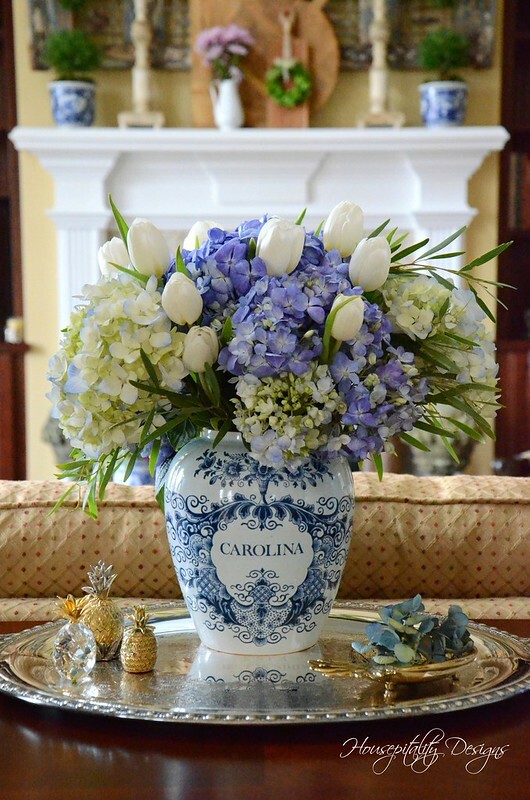 I saw a Carolina Delft Tobacco Jar on the counter waiting to be placed on a table in the shop. It was in perfect condition, but missing its lid. That’s OK, I can use it as a vase! and they are not blooming now, and it is not likely that they would be a Trader Joe’s! So in went some Hydrangeas and Tulips with a few sprigs of Eucalyptus. Southern decor. I added the symbol of hospitality . . . pineapples. and a small collection of pineapples. as it was a gift from my mom over 25 years ago. tobacco leaves . . . The manufacturer of this jar is “Oud Delft” ~ ~ Holland. This manufacturer dates back to the 17th Century and the decoration is applied by hand. I am sure that after some research, I could find a replacement lid. The lid was missing; yet there was a “Certificate of Authenticity” in the jar. Thanks for visiting me for Floral Friday! There will be some great changes to Floral Friday . . . announcement coming soon!!! Have a most beautiful weekend!!! Hope you all have some fun plans! there is still time to enter! Giveaway ends at Midnight (EST) on March 3rd, 2018. Stacey’s recent post…When Are New Chairs Like Old Disco Songs? Just beautiful!! I love that jar. Happy Friday! Beautiful, as always, Shirley. The vignette is too! Rita C at Panoply’s recent post…Sunshine is Great Inspiration; So is a Giveaway! My husband grew up on a tobacco farm. He would love this. Beautiful. Great find, Shirley. Pinky’s recent post…A Tropical Table for 2!!! So beautiful! I love your pineapples! I really enjoy Floral Friday and look forward to the “changes”. I would love a copy of “Beautiful”. Enjoy your weekend! 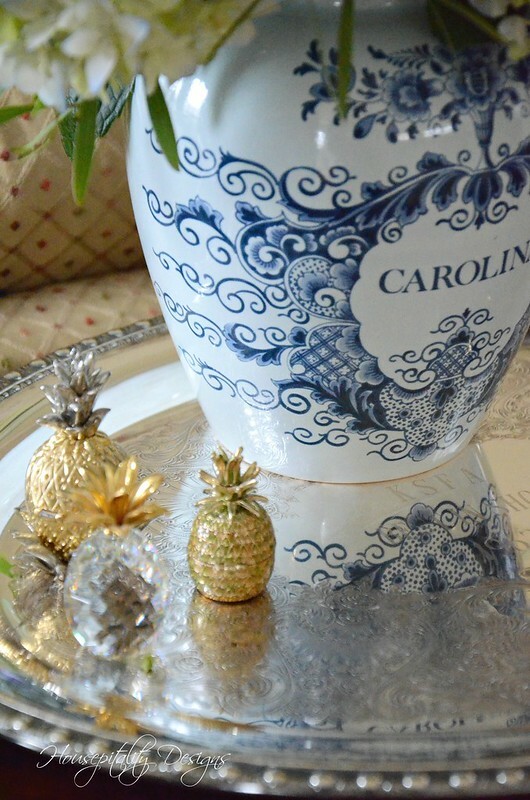 Simply gorgeous Shirley, and I love your little pineapples! What a beautiful vignette! I love the tobacco jar and your floral arranging talent is quite impressive. I think you might have done it before, but you could please repeat the process of how to successfully place flowers in a vase? Mine always look like I grabbed a bunch of flowers and plopped them in water! I’d really appreciate a tutorial! Have a wonderful weekend! The arrangement is stunning! 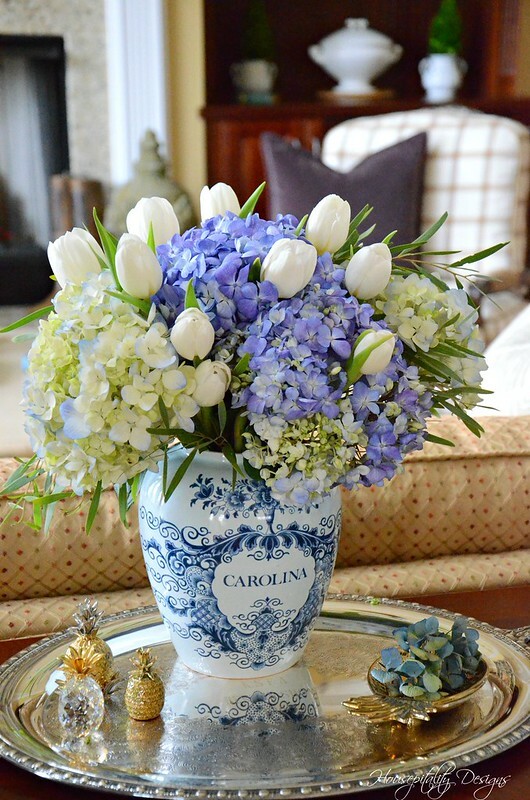 I love blue and white, because is a calming color combination. Beautiful work! I have one just like it. It has a shiny brass lid. Mine was purchased at Williamsburg many years ago. Shirley, you are killing me. 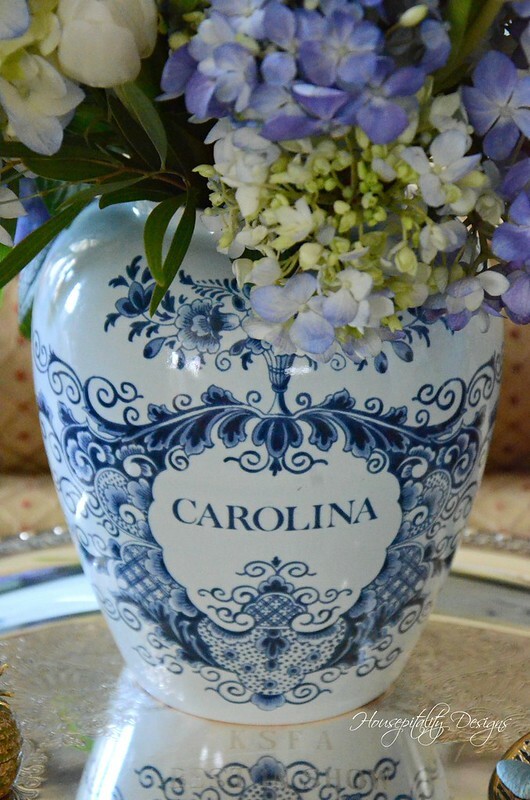 I love the Carolina jar and would buy one if I saw it as I am a North Carolina native living in cold Colorado and would give my eye teeth to move back to North Carolina. I watch for your post every day and get my North Carolina fix from your post. Colorado was my hubbys dream retirement destination. It snows or freezes until May 15th here and looking at your post gets me itching to play in the garden. Oh well, can’t have everything. Just text my girlfriend that lives in NC and asked her about the consignment shop. She does’t know it but we will find it when I go back there in May. Thanks for the heads up. I tell you, lady…you find the prettiest and most interesting pieces!!! I always look forward to seeing what little lovely you have to grace your already beautiful home. You’ve got the eye! Have a great weekend, my Southern sister! Shirley, this was a perfect find for you as you are now a Carolina girl! This is a very beautiful and welcoming arrangement. Shirley, what a stunning arrangement! 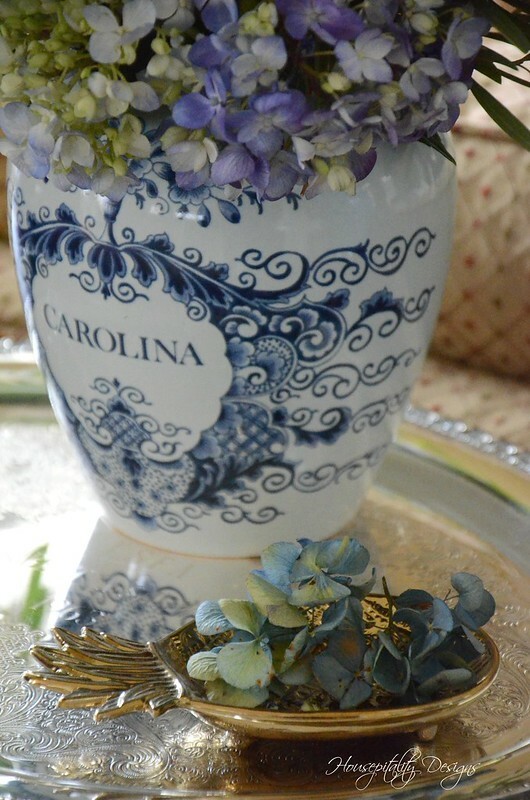 The tobacco jar is a fabulous find and it is beautiful on the silver tray. I have seen so many pineapple objects over the past six months! Beautiful arrangement, Shirley! The tobacco jar is a fabulous find ! 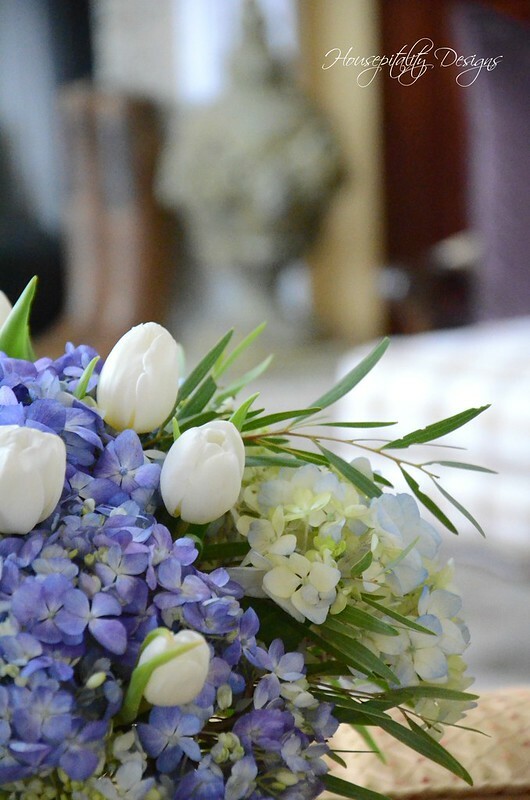 Sandra at Maison De Jardin’s recent post…Two Inspiring Hearts ! 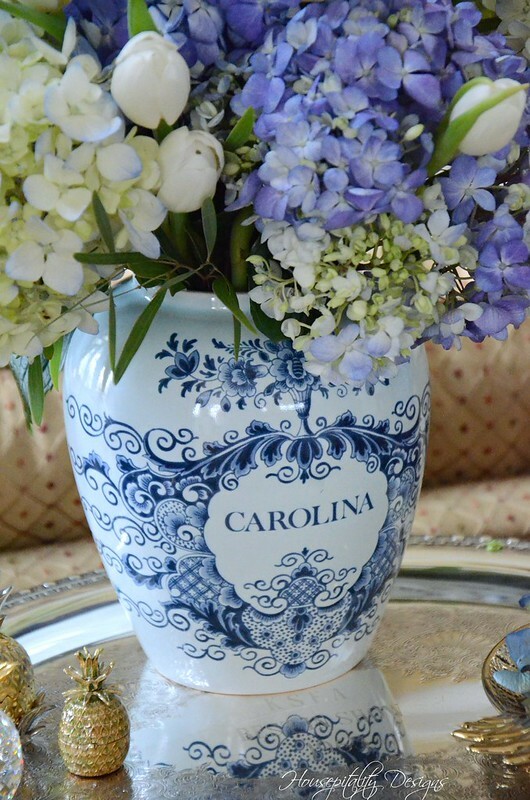 I adore your Carolina Tobacco Jar! I suddenly “need” one of these, like, right now! Lol! What a lucky find. I also have the same Swarovski pineapple. For some weird reason, my youngest son hates it! I mean, why would anybody develop an aversion to something so cute? So, I’ve told him that when I die, I’ll make sure that the pineapple goes to him so he can remember me. I’ve loved your post so much, that I’m signing up to follow you! I can’t wait to see what other treats you have in store!